Monday 4 April from 6.30pm to 8.00 pm. Now with the fourth instalment of ARTTALK, the Korean Cultural Centre UK presents ARTTALK: Filmic Dialogue with Yunjoo Kwak and Igor Sevcuk on Monday 4 April from 6.30pm to 8.00pm. 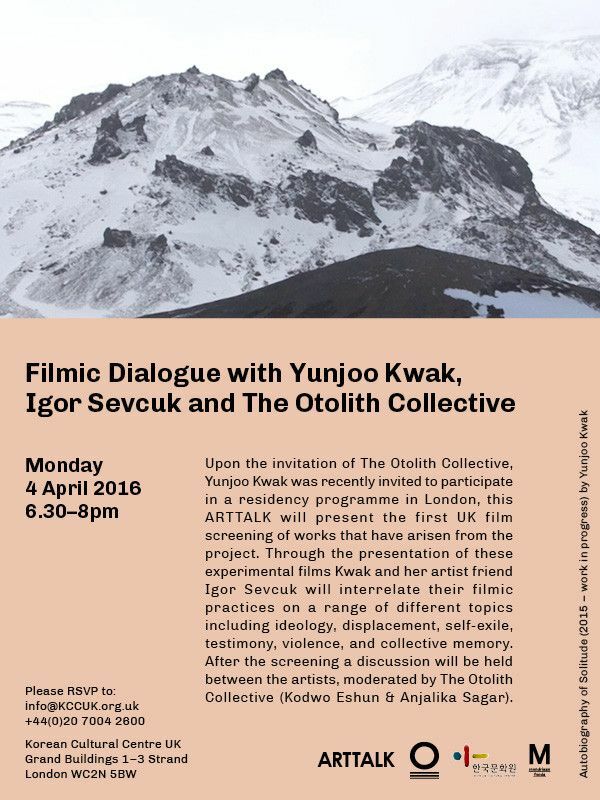 On this occasion, Kwak will present the first UK film screening of works which were developed during her recent residency in London on the invitation of The Otolith Collective. 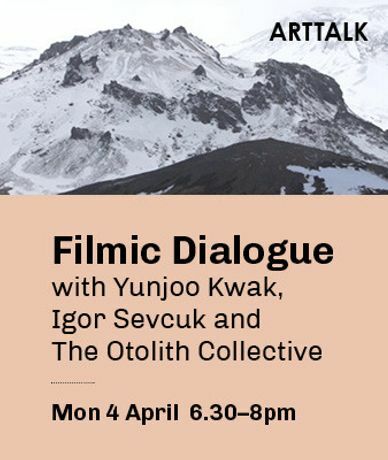 This special talk will begin with a double feature of screenings which present a number of short films produced by Kwak and Sevcuk including Triumph of the Will (2008), Autobiography of Solitude (2015 -work in progress), and Icelandic Grass (2006). Through the presentation of these experimental films the artists will interrelate their filmic practices on a range of different topics including ideology, displacement, selfexile, testimony, violence, and collective memory.In doing so, the artists will intertwine the histories of their former homelands, and personal episodes that form the background for their art. Coming from different sides of the world and now residing in the European Union, these two artists articulate their personal experiences of migration through the moving images. As such, by retracing their journeys and finding the way out of ideological traps, they carry a dialogue within their flmic practice that intensifes the sense of self and encourages greater interaction between persons. 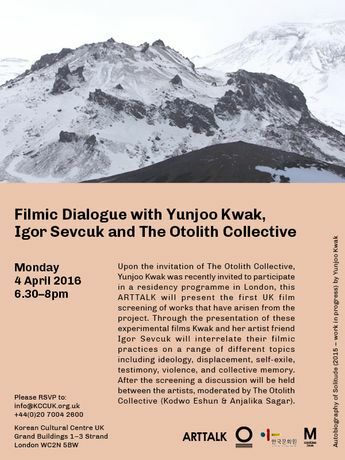 After the screenings, The Otolith Collective (Kodwo Eshun and Anjalika Sagar) will explore questions emerging from the artists’ filmic practice. The discussion will consider the relation of historical and biographical narratives of the exilic to formal and medial questions of narration, speculation, archive and futurity. 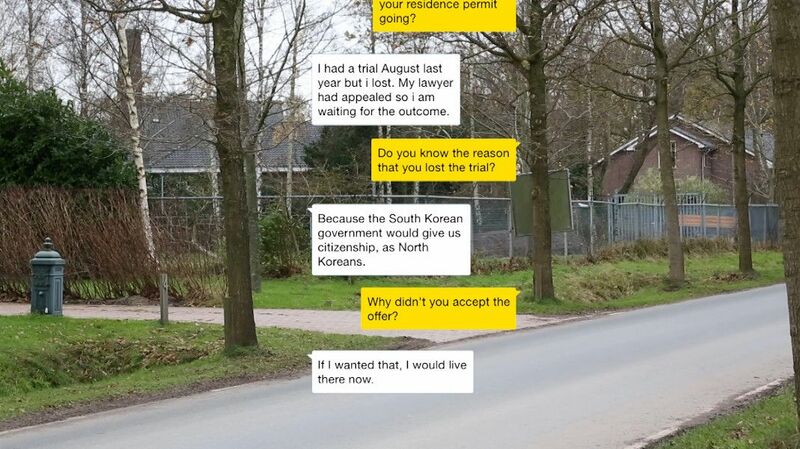 ARTTALK: Contemporary Korean Art Today is an inaugural talk series for Spring 2016. In collaboration with a selection of the UK’s distinguished arts and cultural institutions, ARTTALK provides a platform to explore and understand Korea’s prominent artists and their practice. Using recent exhibitions and residency programmes in the UK as a backdrop featured artists, curators, and critics of international standing will offer audiences an extended opportunity to learn more about Korea’s art scene right in the heart of London.